I’m greatly enjoying America’s Assembly Line by David E Nye. The early chapters are about the Ford Motor Company, and the way a number of incremental innovations in different processes added up to the huge social innovation of mass production. Professor Nye makes forcefully the point so many techno-enthusiasts overlook, which is that technologies have to be used as well as invented. As he points out, the Chinese invented gunpowder and used it for fireworks, the Aztecs invented the wheel – for children’s toys, and the ancient Greeks invented a steam engine but regarded it as a curiosity. I couldn’t agree more strongly with this theme of the importance of the social and cultural context for technology, and its productivity benefits. The chapter on the early stages of the Ford story set out in some detail the explanation Paul David gave in his well-known 1989 essay (pdf) The Dynamo and the Computer: An Historical Perspective for the length of time it takes for a technology – the electric dynamo, enabling factories to use electricity effectively – to be adopted. A key reason is the different kind of building needed for distributed power, rather than machines clustered around a central drive-shaft. I often use Prof David’s point about “technological presbyopia” – this being the term for middle-aged eyesight, when short-sighted people like me become simultaneously long-sighted when it comes to small print. With any new technology, people have a tendency to over-hype the short-term effects massively (so we get tech bubbles) and under-estimate the huge long-term effects (for example, that railways made urbanisation possible). The error of hype is because new technologies often have such great wow factors. The error of not noticing profound change is precisely because many people find it hard to see the cumulative effect of all the many contextual changes needed for a technology to be widely used. 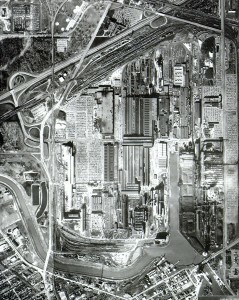 The Ford factory moved twice in relatively quick succession, from a 1904 plant in Piquette Avenue where the Model T was designed (3 stories high, a block long, 39 feet wide), to Highland Park (buildings dating from 1909 and 1914), where the first assembly line was created, to the River Rouge plant, operational from the 1920s, where the whole of the vertically integrated process from steel smelting to final product was co-located. The Highland Park’s buildings were built of steel-reinforced concrete and could carry heavy machinery on the upper floors. There was room to lay out an assembly line. The buildings were lighter, so workers could see better. The increase in productivity was stupendous – the price of a Model T car in 1910 dollars fell from $950 to $214 in 1921. And of course, Henry Ford famously paid his workers twice the going rate so they could afford to buy the product they were making. The public fascination with the factories was intense. By 1916 Ford had 25 full-time tour guides. Even branch assembly plants had 20,000 visitors a year. River Rouge had 166,000 visitors in the year as late as 1940. It’s hard to imagine now. (You can still visit it.) There are industrial museums, of course, and some historic sites such as Cadbury World in Bournville (main purpose of visit seems to be buying chocolate, though) and attract tourists but not factories still in operation. It’s a shame. I’ve been lucky enough to make lots of visits to factories in various jobs, and always find it fascinating. This entry was posted in Main Page and tagged technology by Diane Coyle. Bookmark the permalink. Nice – no, I hadn’t seen it before! The original form of that “technological presbyopia” is a minor curiosity. I have also seen it attributed to Roy Amara (though not with that name), in the form. There is no hard date for that, but the trail I recorded at http://publicstrategist.com/2008/02/the-slow-inexorability-of-the-future/ (particularly the update at the end) suggests that in some form it dates back to the 1970s, so presumably preceding Paul David’s use. And also interesting to see the suggestion that the Gartner hype cycle derives – unattributed – from the same source.